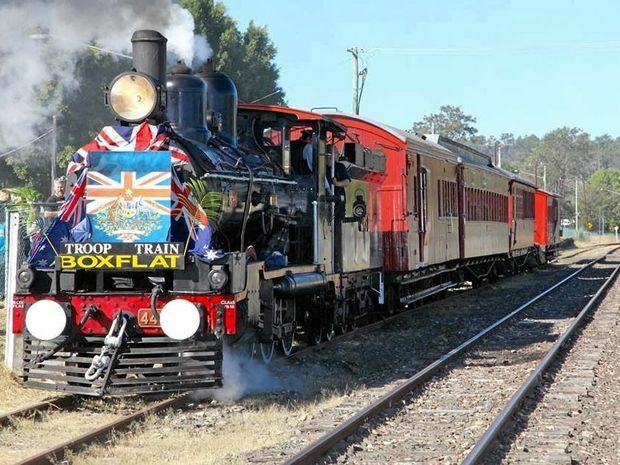 COMMEMORATING the Centenary of Anzac will come alive this weekend, when the Queensland Pioneer Steam Railway runs 'Troop Train Sunday' between Bundamba and Swanbank. Rob Shearer of QPSR said Sunday's celebration is doubly special, with Queensland Rail confirming a rare US-built AC16 locomotive will be loaned to the society for the first time, to partner with their existing PB15 locomotive. "The USA built many of the AC16 types for narrow gauge tracks, they were designed as emergency replacement locomotives, so for one to still survive in running order is a tribute to Queensland Rail," Mr Shearer said. "Both the engines worked in wartime, so this is a rare pairing, it really is a special event for both military and history buffs, but also for rail enthusiasts." Mr Shearer said the day will celebrate the involvement of rail in both World War One and Two. "Trains would run from the Great Australian Bight to Cape York, carrying troops and equipment, and we want to celebrate this." QPSR is partnering with the Centenary of Anzac committee, Mr Shearer said, with field days running at both Bundamba and Swanbank. "The Bundamba end is a recreation of World War One, there will be people in period costume, it is about remembering and commemorating the efforts and sacrifices of the community World War One." At Swanbank, Mr Shearer said there will be a display of World War Two jeeps, buses and other vehicles, while a local dance school will also be running15 minute demonstrations of period dances, including jive and jitterbug. "The round trip takes one hour and 40 minutes, this includes a 20 minute stopover at Swanbank to enjoy the display." The trains run from Bundamba racecourse station, Mr Shearer said, although it is possible to meet the train at QPSR's Swanbank station. "There will be road closures at Swanbank, so the best way will be to go via Llewellyn Street and Patrick Street, but we do recommend people do the round trip from Bundamba." With the rare locomotive combination attracting a lot of interest, Mr Shearer said anyone wanting to be part of the day should book their tickets through the QPSR website. "Bookings are essential, we are expecting the seats to sell quickly."